ANCIENT GRAINS is here! Let's celebrate with a giveaway! 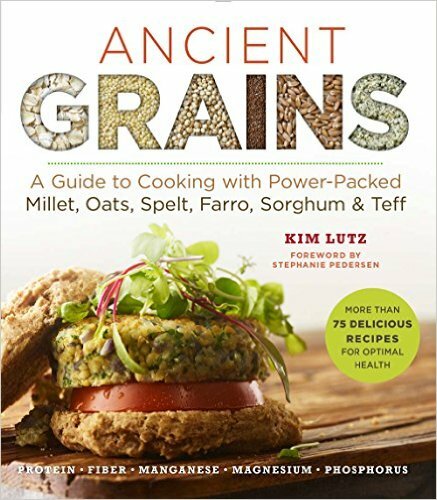 My newest book, Ancient Grains: A Guide to Cooking with Power-Packed Millet, Oats, Spelt, Farro, Sorghum & Teff (Superfoods for Life) is now available! I am very proud of this book. Each recipe features a delicious whole grain that provides nutrition, flavor and delightful texture. Four of the grains are gluten-free: millet, oats, sorghum and teff, and they can really impact your gluten-free menu. For example, tiny teff can be used to crunch-up breaded veggies, like my Teff-Breaded Eggplant Slices. Sorghum can replace barley in mushroom soup, like in my Mushroom Sorghum Soup. 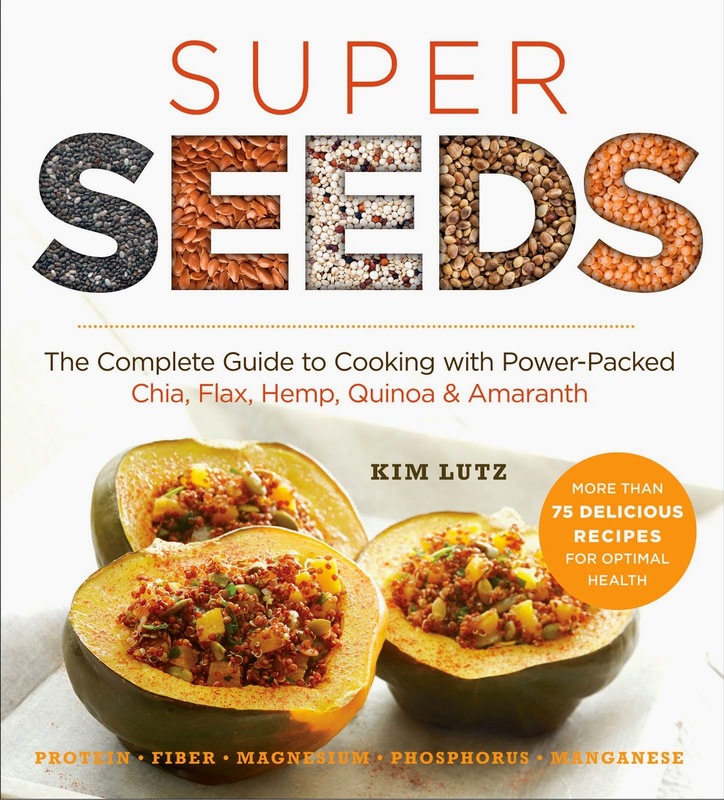 Of course, there's an abundance of baking recipes like Peach Mango Muffins and entree dishes and salads like Millet Tabbouleh that will have you running to the kitchen to get started with this book. Of course this is a vegan cookbook. Every book I write is a collective effort that depends on so many people for its success. For ANCIENT GRAINS, I owe a huge debt of gratitude to Bob's Red Mill. We used tons of Bob's Red Mill grains when I was creating recipes and when my recipe testers were perfecting them. We loved the flavor, texture and high quality of these grains. Thank you for your support over the years. My life has taken turns that I never could have predicted. I am so grateful that my readers have helped me to find all of these new adventures. Disclosure: Bob's Red Mill has provided me with grains to create recipes and test them, and they are providing this prize. Sterling Publishing is providing a copy of Ancient Grains. Please note: Email addresses through the contest will be added to our email list. We never disclose this information to third parties. If you do not want to receive emails, please unsubscribe. Thanks for this wonderful giveaway. I don't know if it is open to Canadian, but I take the chance...hé hé !!! I'd love to cook with ancient grains, as they're so healthy for you and taste so good! I got myself an instant pot for Christmas, and since then, I've been obsessed with learning how to cook different beans, lentils and grains. I've learned to love barley (which I didn't when I was a kid, I hated it!) and sorghum is wonderful in cold grain salads! I want to learn more! Thank so you much for this giveaway! I would like to eat more whole grains! I want to learn various ways to cook sorghum. Kind of stumped right now and have some in the cupbboard. I want to learn how to cook more grains new to me, to go beyond rice and quinoa. I want to continue to include or introduce healthier options for our meals and snacks, I'm anxious to see your cookbook and try the recipes you've created! I would like to try the breaded eggplant. I'd love to try teff, and sorghum. I want to try popping the grains, too! I looking forward to trying different grains I had not considered before. Makes me want to see what goodies is inside this book to try out. Not sure, maybe a cake. I am sure the cookbook will help! Would love to learn more about ancient grains. I have used some in the past, but want to include more into my diet. Thanks for the giveaway! I would like to use ancient gains because they are healthier but dont know that much about them. Your book seems to be my answer. Thanks for a chance to win a copy. I like to try new things. I love new flavors. Wish Amaranth was in the mix, but maybe it has gluten. I'm not affected by gluten, but would love to try these. I eat a whole-foods, plant-based diet, and whole grains are the foundation of so many delicious meals I cook. We are looking into clean eating, so we'd love to try some new grains. I've wanted to try making something with sorghum. I would make some bread with the millet. Excited to try other recipes from the book. Thank you for the giveaway! I would like to eat more whole grains. Awesome!I would love to win. This would be a great addition to my lifestyle change! I would like to use the ancient grains to make stir-fry dishes. As a runner I am always looking for healthy food alternatives that supply a good source of proteins, carbohydrates and nutrients. I want to eat healthier and from what I've read, ancient grains are healthier. I want to cook with ancient grains because many of them are gluten free. My e-mail is elixer2@hotmail.com. I definitely want to experiment making vegan burgers with ancient grains! I am just beginning (again) to try my hand at bread making. I am on day 3 of my first sourdough starter! I absolutely LOVE Bob's Red Mill and would love to incorporate some of the Ancient Grains into bread making. I have also been reading about Ethiopian foods and would love to try the Teff bread. I love adding new grains to my recipes and there are a couple here I have never tried. They sound awesome! Thank you for writing this awesome cookbook, and for hosting this giveaway. I have done a few things with grains not commonly used in US--just enough to realize how little I know about the flavors, textures and nutrients abounding in ancient grains. I'd love to have opportunity to learn from you! Thanks for hosting the giveaway! 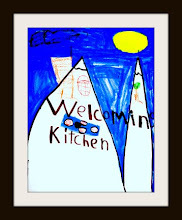 I'd love to learn to use more diversity in my ingredients & cooking methods. Thanks for publishing this cookbook! I wouldlove to try something different. I love Bob's Red Mill! This cookbook looks fantastic! To add to the comment I just left...I love cooking with ancient grains because they are healthy, satisfying, and have wonderful flavour & texture that you just don't get with refined grains. Grains are the backbone of our family's vegan diet and I love learning new ways to cook with them. I would love to use in veggie burgers. i have been trying to eat healthier and eat less meat. i love eating with grains and would like to try new recipes! I have tried all of these grains but sorghum. I love using spelt instead of wheat flour. It makes for lighter, fluffier breads! I'm really curious about teff because I love injera in restaurants! Awesome giveaway! I've always wanted to try cooking with teff, I've tried it prepared traditionally with an Ethiopian dish and loved it, but I've never made it at home. I tried a Farro salad once which was really good. I've never tried any of the others yet!